I’m not perfectly certain but this not-so-little guy sure does remind me of the roaches in our college dorm. 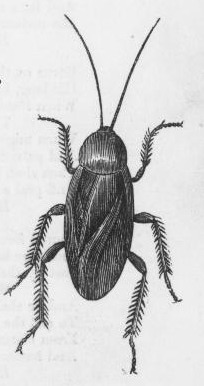 With hairy legs and long antenna, this beetle drawing depicts a large bug on a plain background that would be very useful for anyone looking for public domain bug images. I find it almost hard to believe that here we are over 150 years after this illustration was included in a book published by The Illustrated London News, still enjoying it. It was included in the Illustrated London Reading Book, 3rd ed.